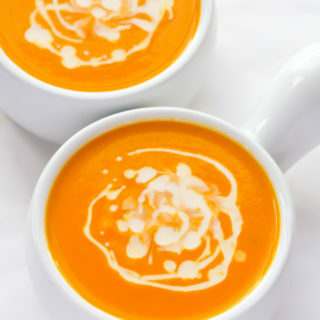 This velvety Carrot Ginger Coconut Soup recipe will warm you right up! A flavorful, healthy soup that is vegan, gluten-free, dairy-free, and paleo. This rich, silky-textured soup is such a delicious way to incorporate carrots into your diet, which are loaded with vitamin A. Ginger adds a light touch of heat and compliments the flavor of the carrots exquisitely well. Coconut milk gives the soup a creamy sweetness, in addition to the carrots which get sweeter as they cook. This soup has a smooth and velvety texture because all of the ingredients get blended together. I use an immersion blender to puree the soup, but you could also transfer the soup to a traditional blender and blend it in batches instead. Only fill up the blender until it is halfway full. Any more than that can cause a serious accident. Remove the center insert in the lid of your blender to allow the hot steam to escape. Then place your hand on top of the lid with a dish towel, keeping most of the hole covered, to avoid any splashes while the blender is running. This soup is great for entertaining because it is gluten-free, dairy-free, paleo and vegan, so it is suitable for many people that are following special diets. Serve it as a delicate appetizer or with warm crusty bread for a light lunch or dinner. 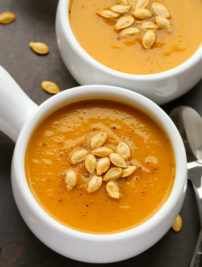 Other healthy soup recipes that perfect for chilly weather and are also gluten-free, paleo and vegan are my Curried Coconut Pumpkin Soup and Butternut Squash Apple Soup. Pot/Dutch Oven – This one is super affordable and the quality is excellent. I love using it to make soups, stews and chili. Immersion/Hand Blender – This is the one I use and love! I have had mine for years and it is one of my favorite kitchen tools. I use it all the time to make soups and smoothies. Coconut Milk – I love the taste and consistency of this brand. It adds so much body and richness to soups and curries. Don’t miss out! Click here to get exclusive discounts on my favorite healthy products and resources! This velvety, flavorful Carrot Ginger Coconut Soup will warm you right up! Naturally gluten-free, dairy-free, paleo and vegan. Heat the oil in a large pot over medium heat. Add the onion, ginger, and carrots and cook, stirring often, for about 5 minutes or until the onion is translucent. Add the broth and coconut milk. Bring to a boil over high heat. Reduce heat to low, cover and simmer for 25 - 30 minutes or until carrots are softened. Remove from heat. Using an immersion blender, puree soup until smooth. Alternatively, transfer to a regular blender and puree in batches until smooth. Season with salt and pepper to taste. Serve warm, with an optional drizzle of extra coconut milk. Craving More?Join my email list and you will get a copy of my cookbook for FREE! Sign up here! © Everyday Easy Eats. All photos and content are copyright protected. Please do not use any of my recipes, text or images without prior permission. Interested in starting your own blog? Check out my step-by-step guide for setting up your blog today! Can this be made in a crockpot? I love to have soups for dinner and keep looking for some different recipes..This one with carrots and ginger sounds so perfect for the cooler weather.. The color,the flavors,everything is so yummy! Hi Deepika! I know I LOVE having soup when its cold outside, it’s like the most comforting thing! 🙂 Thank you for your kind words my friend! Alia, my mouth is watering!! I haven’t had carrot coconut ginger soup in AGES!! I had completely forgotten about it. I love that kind of soup. As soon as we get unpacked and I get my blender back, I’m going to make this!! Can’t wait! Woo hoo I’m glad I made your mouth water! Haha 🙂 Yes!! I’m excited for you to make it! Have a great weekend Maria! Love your carrot soup with coconut milk!! So yummy! Hi! This soup sounds delicious!! I’m wondering if it is possible to make it without coconut milk? Just to blend carrots, ginger and the rest of the stuff. Did you try it? Would it still be tasty? Notify me when someone replies to this comment via e-mail. Hi! My name is Alia and I am the author/owner of Everyday Easy Eats.